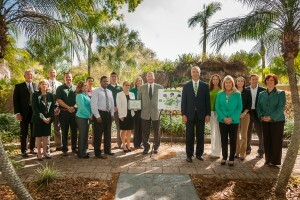 The Sustany® Foundation (Sustany®) and the City of Tampa awarded Florida Hospital Carrollwood with the Green Business Designation at a ceremony in the hospital’s garden on March 19, 2014. 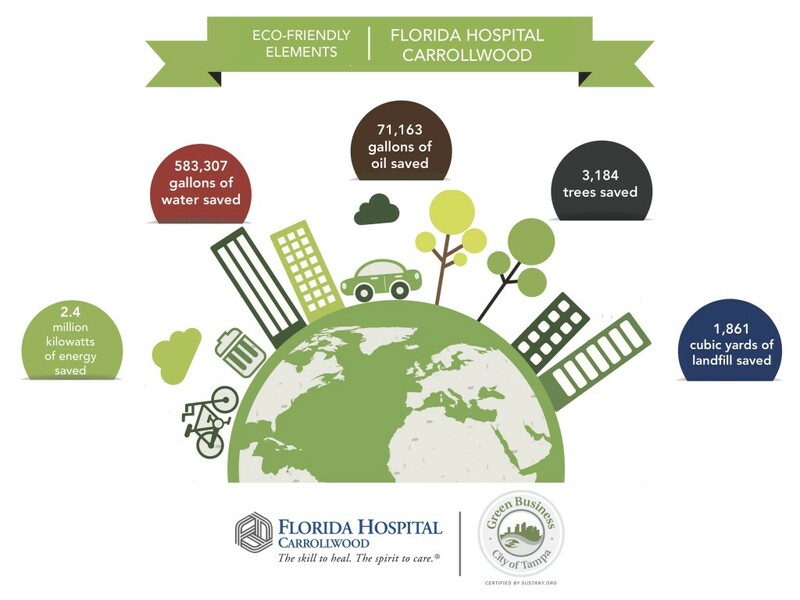 As the first hospital in Hillsborough County to be recognized for sustainable practices, Florida Hospital Carrollwood launched a green initiative in 2011 and has since saved 2.4 million kilowatts of energy, 583,307 gallons of water, 71,163 gallons of oil, 3,184 trees and 1,861 cubic yards of landfill. In an effort to provide services that sustain people and the environment for the future, Florida Hospital Carrollwood operated to decrease consumption of fuel, water and energy. 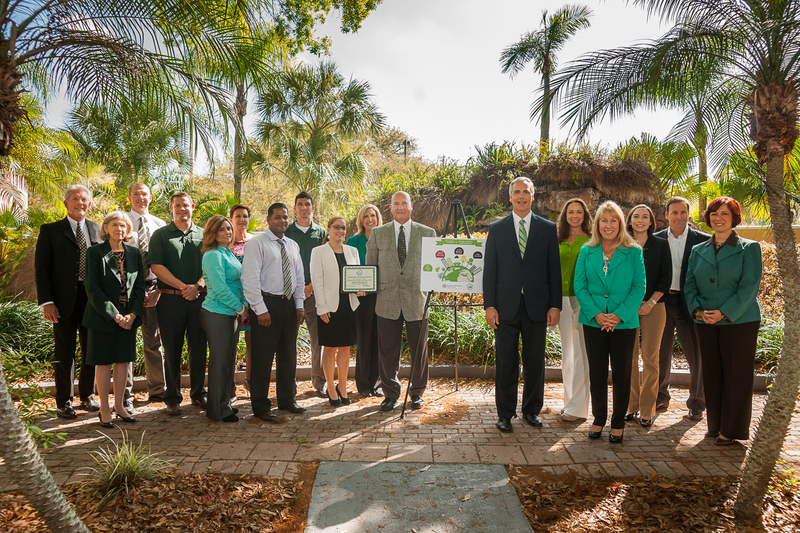 “Florida Hospital Carrollwood has created an excellent foundation for sustainability within their organization. Particularly impressive is their Green Team, comprised of employees, who recognized their collective environmental impacts as well as how their individual department roles are interconnected by social and economic concerns. As the hospital progresses in their efforts, they will continue to not only have a positive impact upon those they serve, but along their entire value and supply chain, says Jenna Civitello, Executive Director at Sustany®. The Hospital worked with Tampa Electric to identify ways to reduce energy and partnered with Stericycle to identify recycling opportunities. As a result, the Hospital replaced more than incandescent bulbs with halogen par lamps, compact fluorescents or low voltage track lighting, established a purchasing policy to only purchase ENERGY STAR® products, monitored and reported monthly statistics related to waste and recycling, launched monthly education workshops to inform clinical staff about recycling opportunities, reserved parking spaces for alternative fuel vehicles and carpoolers and launched a Green Team, to review the Hospital’s progress and strategize new ways to help save the environment. Since January 2014, the Hospital decreased mainstream waste (regular garbage) by recycling more and donating outdated non-medicine supplies to local not-for-profit organizations and 30,683 lbs. of recycling, which is equivalent to 261 trees saved, 5,830 gallons of oil saved, 28,700 gallons of water saved, 234,486 kilowatts of energy saved, 176 cubic yards of landfill.